The town Salzburg and the county Salzburg offer an unbelievable diversity of attractions. Choose your favourite destinations! The impressive centre of Salzburg, the old town, with its baroque buildings, is worth discovering in an own excursion. Since 1997, the old town of Salzburg has been protected by the World Cultural Heritage. Discover step-by-step, during your holiday in Salzburg, the most beautiful places of the Mozart town. A special form to do sightseeing in Salzburg is by “Fiaker”, traditional coaches. With these coaches you can explore Salzburg most stylishly. Another attractive alternative: Since 2002, after a break of 110 years, you can make a boat trip on the river Salzach again. So you can discover special views of the Mozart-town Salzburg, which are hard to find by other means. Sometimes a break is recommended – enjoy the coffee-shop culture of Salzburg. Don’t begrudge yourself a time-out with excellent coffee specialities and a diversity of sweets which are world-famous. A speciality of the town are the generous greenbelt recreation areas, a.o. the local mountains. Incomparable natural beauties open up for you in the middle of the town. He who looks for piece and quiet or fantastic views over the city of Salzburg is on the right place. Next to the Hotel Jedermann, for instance, is the Kapuzinerberg. If you are lucky – it seems unbelievable – you can even see chamois! Around the town Salzburg is the legendary Salzburger Land, the region of Salzburg. Nestling between the smaller and higher mountains of the Alps, you can enjoy an incomparable lake scenery. In summertime, there will always be a bathing place for you at one of the clear lakes not far away, and in winter you can choose from numerous skiing areas. Regional delicacies await you in the whole county, in the traditional inns as well as on the farmers’ markets. And if you wish to spoil body and soul, a day in one of the thermal spas would be just the thing. Your children, too, will not be disappointed. You can choose from numerous funny and exciting attractions for the small and bigger ones. The Hotel Jedermann is the ideal starting point for all your activities during your holiday in Salzburg. And the team will be glad to support you if you have questions about destinations for excursions. Salzburg’s history is closely linked with salt. Already in the millennium before Christ the region had a quite numerous population. During the Roman time, Salzburg was an important base at a much-travelled trade road. Subsequently the town was built by the Catholic Church and Salzburg reached its peak during the medieval times. History is so obviously present as in very few towns; during your walks through the old town you will have many opportunities to verify it. The Getreidegasse (grain lane) is well worth a visit even today. This was the most important road to the north in Roman times. Nowadays it is a pedestrian precinct and you can stroll along the lane and visit exquisite shops. On your way to the house where Mozart was born you will also pass through the Getreidegasse. You will be fascinated by the impressions of the life of one of the greatest musical talents. You cannot miss seeing the fortress Hohensalzburg above the city of Salzburg. You can reach it on foot or with a railway. Authentic Middle Ages with manifold facets await you. Furthermore, a unique panorama view over the roofs and church spires of the baroque city presents itself to you. The cathedral of Salzburg is the largest church building in the town of Salzburg. The impressive monumental building in early baroque style has a lot of treasures waiting to be discovered by you. The arch-abbey St. Peter is a Romanesque building which has received a baroque exterior during the centuries. You can see the rock tomb of St. Rupert, Salzburg’s patron saint. Nowadays the mayor’s official offices are situated in the castle Mirabell. He also appreciates the luxury, same as the princes and aristocrats in the centuries before him. Located in the middle of the glorious castle garden; you will not regret this visit. The Residenz was the residence of the bishop in medieval times and presents itself today as an early baroque building within the ensemble around the cathedral. 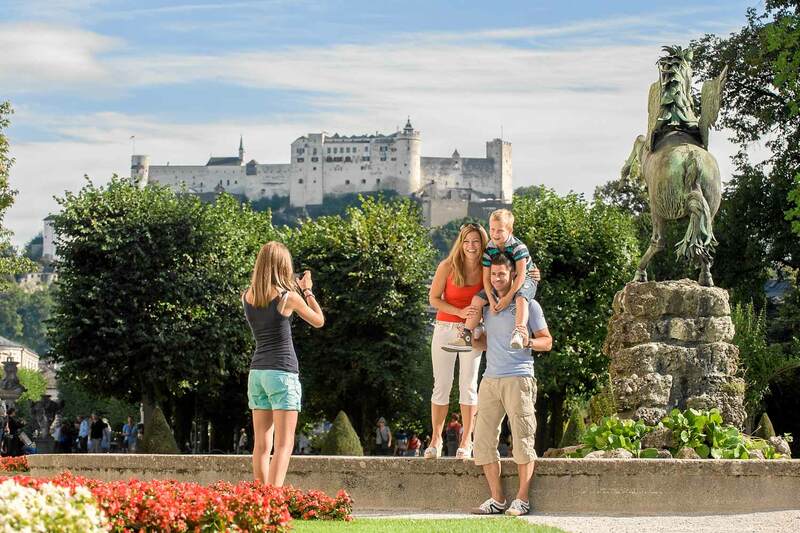 In addition to these tips for your excursion, the city of Salzburg has a lot more to offer you. In the Hotel Jedermann, you will be staying close to the best spots of Salzburg.